As the Father sent me, so am I sending you. Going therefore, teach ye all nations and behold I am with you always, even to the end of the world. Have you ever wondered about that traditional prayer: ‘May they rest in peace’ ? The job is done, the race is run, let us sit back and relax and enjoy the life. After the Resurrection when Jesus appeared to the newly-formed community of faith, his greeting was: “Peace be with you“. But instead of letting them sit down and relax he commissioned them, as the Father sent me so am I sending you… go, teach all nations… make disciples of all nations… I am with you always even to the end of time. The Risen Jesus commissions the newly-formed Christian community to be his proxy, to take his place. 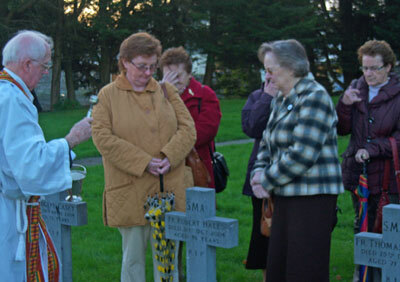 Fr Bernie Cotter blesses the grave of Fr Bob Hales SMA in the presence of his sisters and other family members. And so, we, their descendants, are now his sent ones, who will continue his mission of teaching, healing and ministry. And since Pentecost, we believe our relationship with God has been sealed and empowered, by the power of the Holy Spirit. This is why I have chosen the Readings we have just listened to. In the reading from John 1: 1 – 4 we are told who Jesus is – the Word who is life, who existed from the beginning, is our subject. This quotation from St John is found at the beginning of the SMA Constitutions & Laws, leaving us in no doubt as to who our subject is. In our first reading – Isaiah 25: 6a, 7 – 9 – we are told that he has destroyed death forever and that our hope is in him. The Responsorial Psalm and Gospel Acclamation tell us to sing a new song… we are to go out to the whole world and make disciples of all the nations… and Jesus will be with us always, even to the end of time. The Spirit of the Lord has anointed me and he has sent me to bring good news to the poor and set the downtrodden free. When Jesus said to the first christian community, as the Father has sent me, so I am sending you, he was also speaking to us. We are the ones to preach his Good News in our time. We are the ones to bind up hearts that are broken in our time. We are the ones to lift up today’s downtrodden. We have countless role models of men and women, past and present, who have and are fulfilling this mission of Christ. But when we are looking for people to inspire us and be our role models we don’t have to look any farther than our own SMA relatives who have gone before us. I like to think that we have come here today, not to mourn them, but to be strengthened by them as we try to live out the mission of Jesus in our day. Inspired by the Holy Spirit, they took up the challenge of Jesus and left everything and followed him. Full of youthful enthusiasms they set out for Africa to preach the Good News. 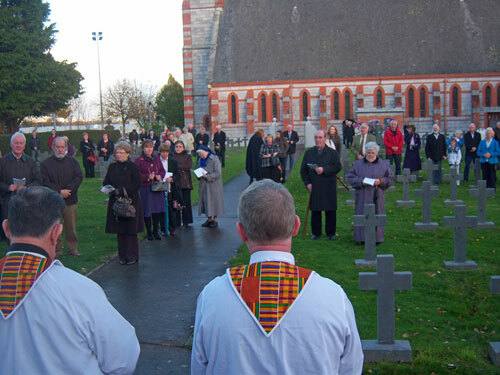 In past years we used have a Departure Ceremony for them, a send-off… the opening line of the Departure Hymn was “Go forth, farewell, for life, o dearest brothers“. This proved to be literally true for many of them. They never saw Ireland again. They never saw their relatives again. Their names are written in stone in that quiet corner of our graveyard, next door to this church; their bodies are buried elsewhere.. 27, 28, 29, 30 years of age. Those standing stones give a great insight into the life expectancy of SMA’s from those early days when Africa, especially West Africa, was called the Whiteman’s Grave, down to the present days when we are reaching 70, 80 and even 90 years of age. 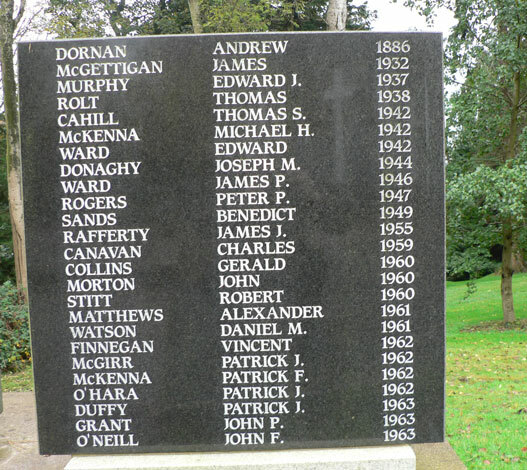 One of the Memorial stones in African Missions, Dromantine listing some of the SMA’s from the Armagh Ecclesiastical Province and their year of death. Whether they died young like the students in the early graves outside or whether after a long life, they all gave the gift of their life to Jesus, to follow in his footsteps and preach his Gospel… and they never took back that offering. Each and every one of those lives carries its own story and is a source of inspiration for us: the young student who died of natural causes or the one who gave his life heroically trying to rescue his companion from drowning; or the strong men, who as brothers, priests or bishops, bore the heat of the African day, the mosquitoes, the malaria, typhoid, dysentery… who never had enough help or money to do what felt needed to be done, who died after spending half a century building the Church of Jesus in Africa. Or the sick men who, against their wishes, had to abandon their dream and return home. These were often the unsung heroes who travelled the roads of Ireland collecting money, who worked in our home houses, who ministered in parishes in Ireland, England and North America and by their dedicated service promoted the mission of Jesus and kept the SMNA going. 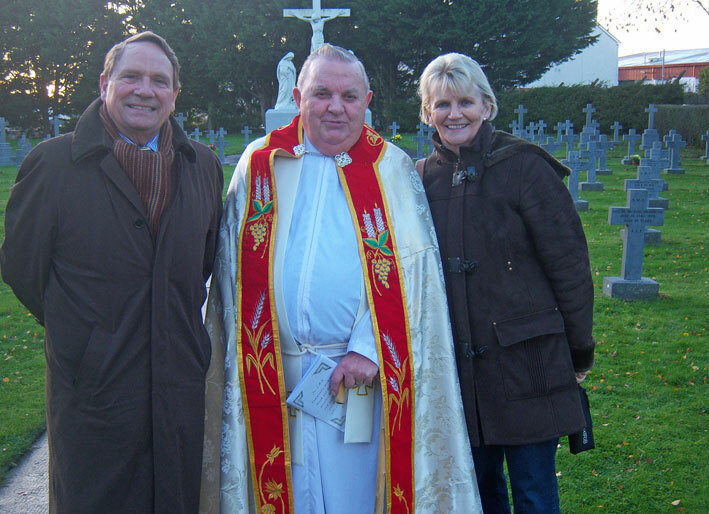 Fr Bill Foley SMA with Tom and Mary Burke, brother and sister of the late Fr John Burke SMA. Or those who were appointed to home positions of formation, communications, promotion, caring for the sick and elderly and those who were elected to administrative posts. With few exceptions, I would think that each one of them would have preferred to spend his life on the missions in Africa rather than in Ireland. Or a new phenomenon in missionary societies: the retired. These were the members who, with the best of medical care, clocked up 70, 80 and even 90 years of age. Every one of them, even those who were seriously ill or handicapped, were active in their own way, in promoting the mission of Jesus right up to the end of their earthly life. Yes, all these men, your own relatives among them, were heroic and inspirational. Every single one of them. May they rest in peace! May they rest in peace? I can’t see them resting while the Good News of Jesus has yet to be preached to all the nations. St Teresa, Patroness of the Missions, said she wanted to spend her eternity planting the cross of Christ in every pagan land and praying for priests, especially missionaries. We don’t know what goes on in eternity. Jesus didn’t tell us much except to guarantee us a mansion where we would be happy. Nobody else has come back ot tell us anything. We don’t know what goes on, but we profess to believe in the intercession of the saints and so I believe our relatives-gone-before-us continue to help us in heaven as they did on earth. Family and friends stand at the graves of their SMA relative buried in the SMA community cemetery in Wilton during the Blessing ceremony. On this special day may we remember them, and especially our own, with pride, as alive and active and helping us to play our part in bringing the good news to the poor, binding up the broken-hearted and setting the downtrodden free, in our place and in our time. On this special day we also remember the SMA’s who are still active in their earthly ministry. Lest you think we are dying out, could I give you a few statistics?